Find your sunflower ring here! 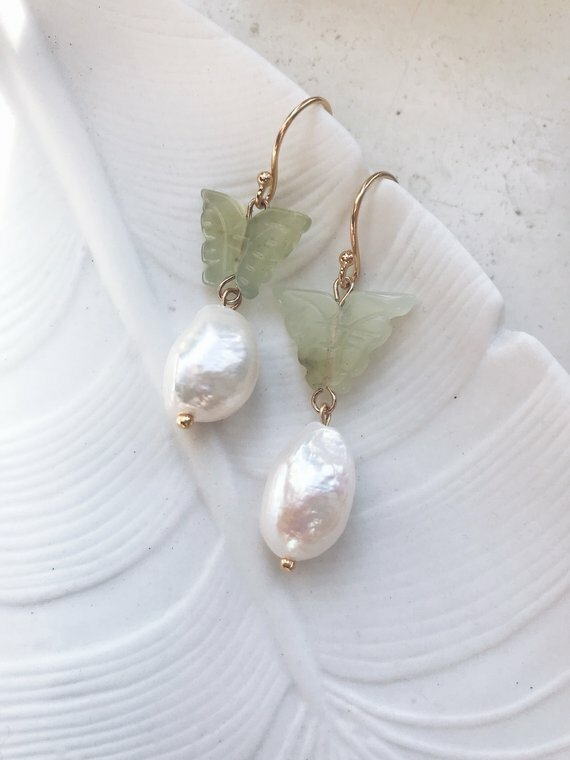 As a jewelry lover, Etsy is definitely my favorite shopping place. There are so many styles that I love, bold, sculpture designed, cuff and.. Chinese style. By over 3 years shopping experience on Etsy, I highly recommend an Asian style shop, The Pillow Book. Among all the other shops who sells Asian style jewelry, The Pillow Book is always my favorite one. This brand was created and designed by a jewelry designer from New Zealand, Kate Ross, who had lived in China for more than 8 years. Asian culture has inspired her to create those lovely jewelry pieces, which, I would say, are more like the combination of western and eastern artistic inspiration. The jewelry of The Pillow Book mostly is made by Jade, pearls, gems and wood. But when you take a look at the page of this shop, you will see that pearl items are really outstanding among the others. Keshi Pearls which is a big trend in these years are used in her designs. Earrings, necklaces and bracelets are all becoming showing by this kind of pearls. Especially in this year, many popular jewelry brands, like Meadowlands, have start to bring Keshi Pearls into their latest collections. Personally, Keshi Pearls has been on my wish list for quite a while. Unlike those well-known brands, the prices of Keshi Pearls at The Pillow Book is reasonable enough. If you think Keshi Pearls are more like western style, then their jade jewelry is much closer to Asian. As a Chinese, I love jade. However, it is not that easy to find trendily designed pieces in China. I love Kate’s designs because she is doing a good job of modernizing this traditional Chinese jewelry. All of her designs are simple and strongly oriental. Next Post 3 Kind of Amazing-Looking Saltwater Pearls!